For applications that require thinner, yet sturdy webbing construction, we offer a thin nylon webbing in 1/2", 5/8", 3/4", and 1". The 1" has a breaking strength of 1,100 pounds, which is nearly double that of our regular-weight polypropylene webbing. Thickness 0.035 inches +/- 0.003 inches, available in black and white for 1" and black only in the other sizes 3/4". All sizes are put up on 100-yard rolls or sold by the yard. 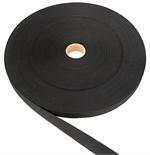 Our thin nylon webbing not a mil-spec webbing, but still comparable to mil-spec 17337 (W-N-06).